Remember this post? The mystery brand conducted a huge facebook-driven campaign involving over 500,000 secret samples being sent out to households across the UK. Feedback on the mystery product has been pretty positive with 91% of testers saying that they would recommend the product to a friend. Well, I can finally reveal the brand behind The Big Skincare Mystery (and some of you guessed it!) as Clearasil! The new Clearasil Vitamins & Extracts range has been packed with superfruits known for their antioxidant properties and soothing plant extracts, and the flagship product in the range is the new Clearasil PerfectaWash. A face wash dispenser that automatically dispenses the perfect dose of cleanser to ensure effective cleansing without over-drying. This is available in two variants: superfruits or soothing plant extract. 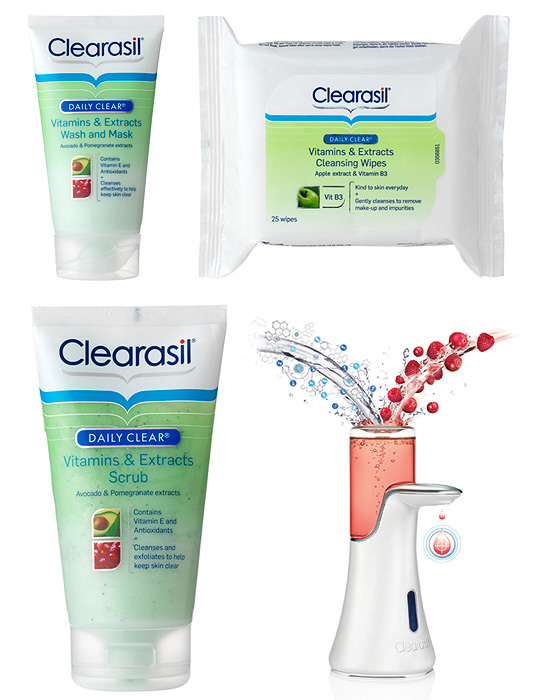 In addition to the PerfectaWash, Clearasil’s new range includes the 2 in 1 Vitamins & Extracts Wash and Mask (the one we’ve all been trialling), Vitamins & Extracts Scrub and Vitamins & Extracts Cleansing Wipes. As for how I got on with the 2 in 1 Vitamins & Extracts Wash and Mask*? Well pretty good actually. I didn’t experience any of the dryness that I would normally associate with using a product aimed at problem skin-types. Literally, none at all but I wasn’t keen on the scent and as a result, didn’t enjoy using this as a mask – I prefer something that feels and smells a little more luxurious on my skin! Having said that, I will be repurchasing this to use as a daily wash (used after oil cleansing) simply because it left my skin feeling freshly cleansed without being stripped and it’s cheaper than my Bare Minerals cleanser. If it goes on to do effective battle with my blemishes and breakouts, then even better! I think combination skintypes are going to really enjoy this product. I got sent these to try out from the Glamour Reader Panel late last year, was wondering if the secret brand was indeed the stuff I’d been sent The kid in me loves the Perfectawash, although I’m sure my flatmate has been using it as handwash! I felt a bit cheated by this, was really looking forward to seeing the results released on facebook (or on here) and instead I accidentally flicked past an article on it in a magazine last week. Bit disappointing. The product itself was pretty good but I understand what you mean, there was little luxury in it I just sort of stood around waiting to take it off. Did the job though, and that’s really the main point isn’t it?! Ha. I had the same experiences as you, I’m pleased to have found a cheaper alternative to my usual cleanser for my combo/dry skin but really didn’t experience any ‘pleasure’ in using it, if that makes sense. I’m still searching for my HG cleanser for my nightmare combination skin so definitely going to check this out next time I’m in Boots.